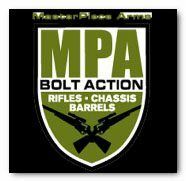 MPA 6.5 Creedmoor/224 Valkyrie Bolt Action Rifle Combo (Switch Lug) Custom Cerakote Colors add $135 for the chassis body and $65 for the barreled action. Check with us for all the custom colors available. Xtreme Guns and ammo carries the full line of Masterpiece Arms Rifles in Stock including the MPA 6.5 Creedmoor/224 Valkyrie Bolt Action Rifle Combo (Switch Lug). Feel free to call XGA at 832-363-3783 or chat with us during regular chat hours.